Well that was fun! The week-long, day-by-day Crosscut Quilt-Along on Instagram just came to a close, though folks will be working through this week (and beyond) to finish up their quilts. Over 80(!) folks joined in to try a new technique, and from the sounds of it, they enjoyed it! Through the process, their simple X blocks were transformed into something quite unique. Even though we all followed basically the same process, it's been amazing to see the different personalities of each piece. I hope to share many of them here with you in the days ahead. Meanwhile, I was sewing right along with the rest of them! Unlike my previous Crosscut quilt, this time I mismatched my background triangles, but I still pulled from the scrap bin for the Xs. Then I repeated the organic quilting design of the first, beginning by hera-marking guide-lines about 6" apart, then quilting randomly between them until I felt it was enough. I guess I enjoyed it so much the first time, I wanted to do it again! 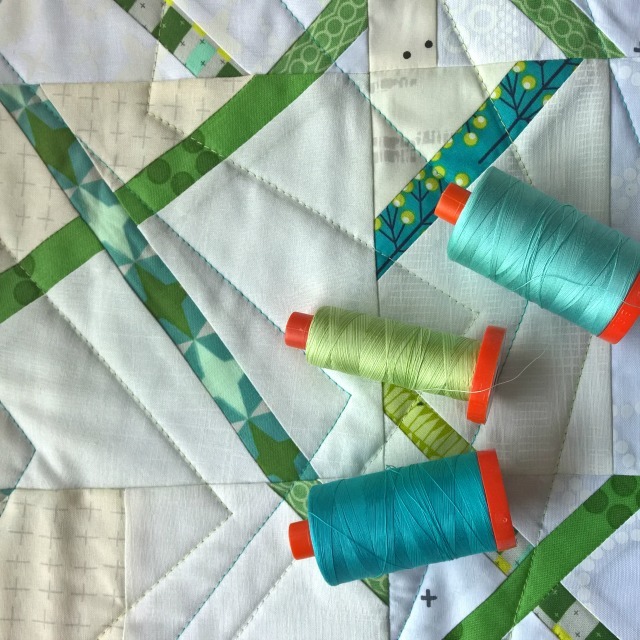 I chose three beautiful 50wt Aurifil threads for the quilting: using mostly the variegated #3320 (Spring Green), with accents of #5006 (Light Turquoise ) and #2810 (Turquoise). Binding is a little ho-hum. I used one of the prints from the quilt, but the design was so spread out, half of it ended up on the back of the quilt. Note to self. I did include some of my leftover strips, which I'm happy enough with. Anyways, it was a terrific week. I was especially touched by those who were participating in their first quilt-along ever, loved that some folks were trying improv for the first time, was amused by those hesitant to slice up their initial pieced blocks, and inspired over and over by the color combos, quilting, and wonderful ways so many made it their own. All in all, it was a very good thing! 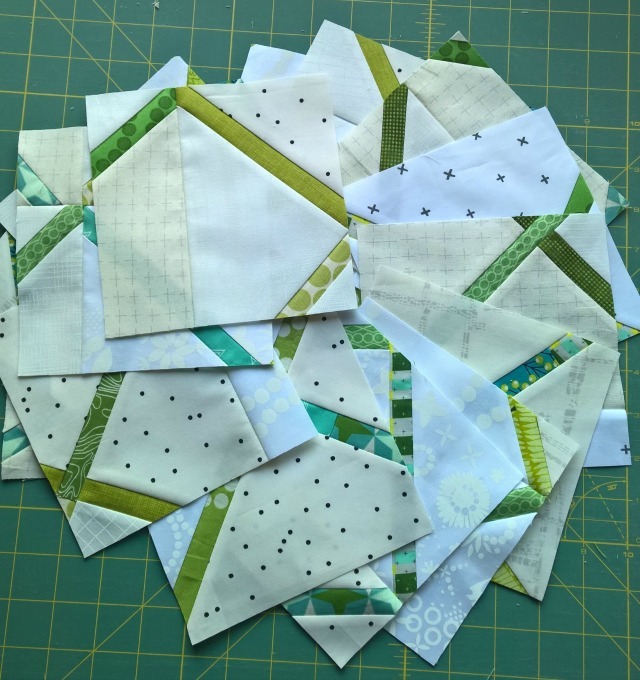 If you weren't able to join in the quilt-along, know you can find the complete Crosscut tutorial right here on the blog. Check in on the #crosscutquiltalong hashtag to see all of the #crosscutblocks made this past week! I think you'll enjoy them! I enjoyed seeing everyone's progress and hope to make one in the future! 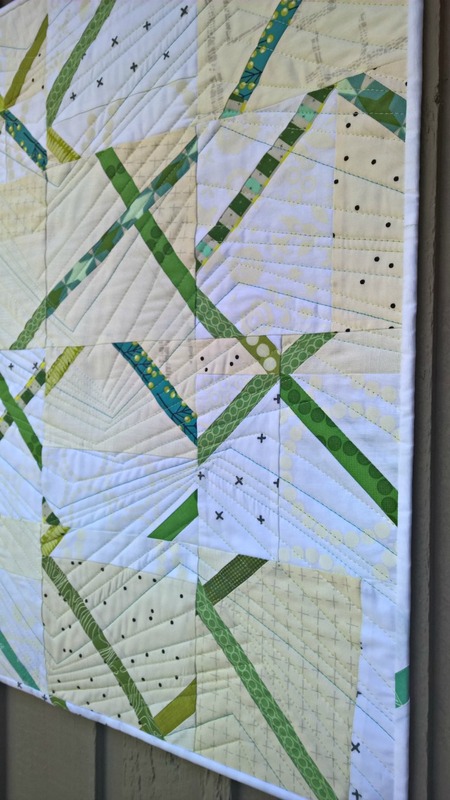 I like your green version and the quilting also! I had so much fun - thanks again for hosting. I love your green version! I plan to make another one, this time, using a low volume background instead of the black. It was so much fun to watch come together on IG; it's a great interface for quickly viewing a lot of content. I agree that the color combos were quite inspiring. So much fun! It really was the perfect project for a quilt-along! And yes, a super great diversion! I enjoyed watching everyone's progress. I am always surprised at what happens when things get cut up and put back together. 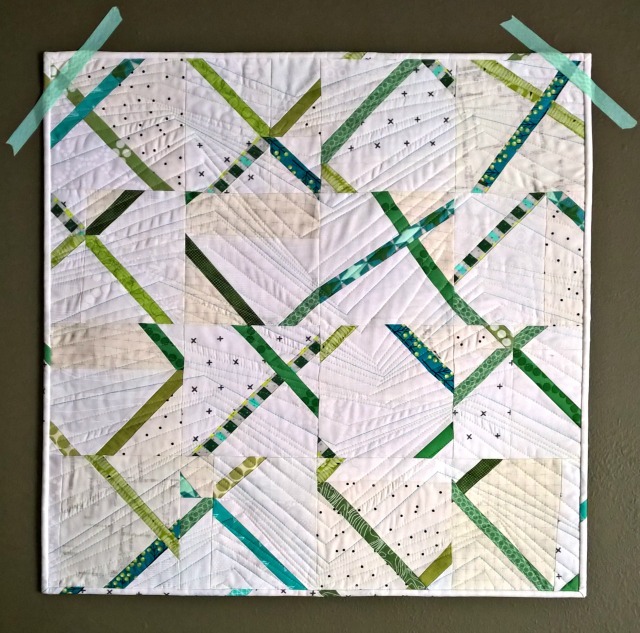 It's a great way to break into improv quilting. Looks great! Putting this on my to-make list! Debbie this was such a fun project. I've done just a tiny bit of improv in the past so I count this as my into and it was fabulous. Tried random straight line quilting for the first time too. Great project all the way around. Loved the IG connection. Thanks so much. I wasn't able to join in, but I am stalking your tutorial! I don't know which one of your projects I like better! They are both so much fun!!! Love the green crosscut. I've started one as well but I'm just at step one. 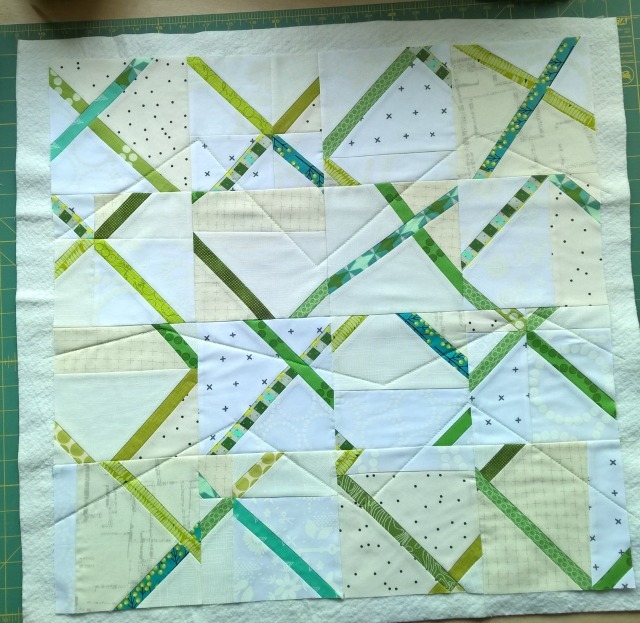 I am still catching up with the quilt-along, (oops, somehow I only managed to cut out only 13 blocks, so a little more improv to be done!) Thank you for sharing the instructions, it has been great to follow along on IG the quilts that others have been making. I didn't have time to take part in this QAL but I enjoy to look at the beautiful works! 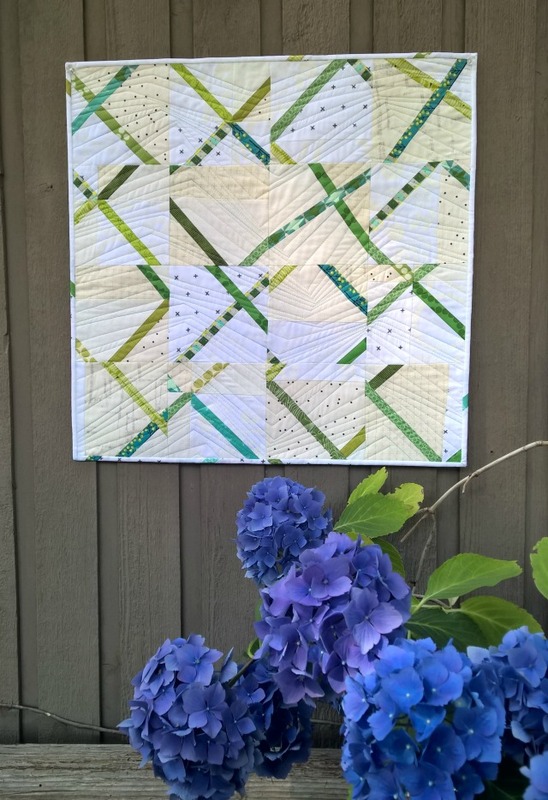 Yours is a real success in green and the quilting emphasizes the modern improv look. I was one of the QAL newbies and I enjoyed it very much! There was an enormous positive feed back from quilters on IG, too. My quilt is not yet finished, still waiting for that currently-out-of-stock-thread, but will finish it soon. I really like your green crosscut version. 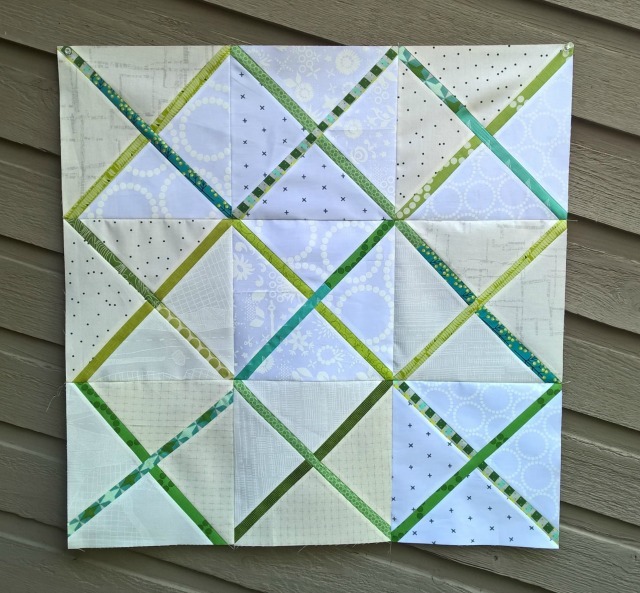 Thanks again for hosting this great and super quick QAL!